We are in Afghanistan to protect our own national security by helping the Afghans take control of theirs. We do not seek a perfect Afghanistan but one able to maintain its own security and prevent the return of international terrorist groups, such as al Qaeda. On 11 September 2001 al Qaeda carried out the worst terrorist attack in history. Nearly 3,000 people, including 66 UK citizens, were killed - the biggest loss of UK life in a single terrorist incident. The Taliban were asked to give up the leaders of al Qaeda but they refused, so the international community acted to remove the regime. Since the Taliban were removed from power in 2001, al Qaeda has been denied safe havens in Afghanistan and the terror threat coming from this region has been reduced. We have the right strategy to establish an Afghanistan that can maintain its own security and prevent the country from again being used as a safe haven for international terrorists, such as AQ. And we have enough time to achieve it. The Prime Minister has made it clear that UK Forces will no longer be in a combat role or in significant numbers in Afghanistan by the end of 2014, but the UK’s long-term commitment to Afghanistan will last beyond 2014 and is key to achieving our long-term security objectives. As transition to the Afghan National Security Forces progresses our mission will change from combat to support. Post 2014 will see an Afghanistan in which Afghans control their own security – and in many areas of Afghanistan this is already happening. What do we do in the country? Our most obvious commitment to Afghanistan is militarily. We are part of a 50-nation coalition, mandated by the UN Security Council and working at the invitation of a democratically elected government. Our forces are making progress with their counter-insurgency and training missions. Sadly, we have lost brave and committed service men and women. Their sacrifice will never be forgotten. Our involvement in Afghanistan extends well beyond military operations. We are working with the Afghans to build better governance, essential services and infrastructure. International support for Afghanistan will not end in 2014. We and our allies will maintain a very strong relationship with Afghanistan, based on diplomacy, trade, aid and development, and on training Afghan troops. At the NATO Chicago Summit the international community reaffirmed its commitment to support Afghanistan’s security forces post 2014. The UK announced our contribution of £70m per year. In addition UK troops will support the development of the Afghan National Security Forces by providing training at the new Afghan National Army Officer Academy. And we will continue to support Afghanistan’s long-term development beyond 2014. As foreign forces withdraw from Afghanistan, its stability and security will also depend on Afghanistan’s continued economic development. 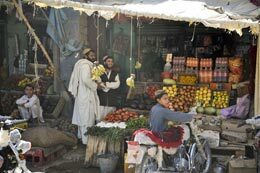 Afghanistan has made significant development progress over the last decade but challenges remain. The Tokyo Conference on 8 July must now deliver much-needed aid commitments to ensure Afghanistan continues to develop long after 2014. The UK has announced our contribution of £178m per year until 2017. The Afghan National Security Force’s (ANSF’s) operational effectiveness is continuously improving, allowing them increasingly to take the lead in many operations. 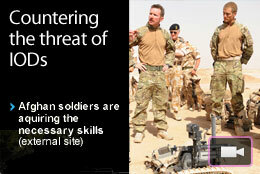 UK and international partners are supporting the ANSF with operational training and mentoring. The ANSF are demonstrating that they are able to lead on security effectively and competently in tranche one areas. The third tranche of areas to begin transition, announced on 13 May 2012 by the Afghan Government, demonstrates continuing progress in the development of the ANSF. Across Afghanistan, this announcement means that Afghan Forces will soon begin to take lead responsibility for the security of about 75% of the country’s population. The international community will continue to support the ANSF beyond 2014. 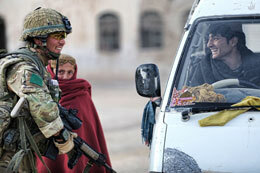 The UK will take the lead at the new Afghan National Army Officer Academy in Kabul. And we are discussing with our Afghan and international partners the future size, shape and funding of the ANSF, in order to ensure it is sustainable and sufficiently capable. If lasting stability is to be established, Afghans need to know they can fare better living peacefully and legitimately. There is an Afghan-led process to encourage high-level reconciliation with insurgent groups and the reintegration of fighters into Afghan society. This depends on insurgents abandoning violence, accepting the Afghan constitution and renouncing ties to Al Qaeda. The UK Enduring Partnership Agreement, the US/Afghanistan Strategic Partnership Agreement and other bilateral agreements send a powerful message to the Afghan people and the region that we our support will last well beyond the end of our combat mission in 2014. They also send a clear message to the Taliban: you cannot wait us out and now is the time to participate in a peaceful political process. The success of any political process will depend on the participation and support of Afghanistan’s neighbours. Pakistan has a key role. A political settlement in Afghanistan also reinforces stability and security in Pakistan. 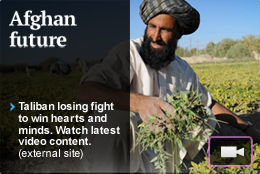 2010 saw the first solely Afghan-run Parliamentary elections since the 1960s. The election was not perfect, but over four million legitimate votes were cast. The government is developing the structures that its people need, although there is still much to do. Approximately 5.8 million children are now attending school, up from just one million in 2002. 38% of these are girls, up from almost none in 2001. Literacy has surged. Eighty-five per cent of Afghans now have access to a healthcare facility in their local area compared to just 9% in 2002. Ordinary Afghans have made it clear that they value justice highly, and they are concerned about corruption. Their government’s response, with international support, has been to build a much larger and better trained police, and to improve courts and prisons. Among Afghans, there had been little respect for the police. But according to a 2011survey, more than four out of five respondents say that the ANP is honest and fair with the Afghan people (85%) and a similar proportion of respondents say the ANP helps improve security (83%). Newly trained prosecutors are at work. The British-funded prison in Lashkar Gah is providing essential facilities to deal with criminals. A Major Crimes Task Force and an Anti-Corruption Unit are being developed. 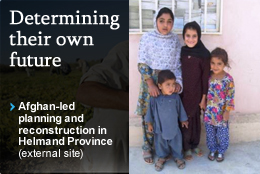 Thirty years of conflict devastated Afghanistan and denied most people access to basic services. Now key infrastructure projects are underway, delivering water and sanitation, roads, airports, schools, colleges, hospitals and clinics. The country’s economy has been developing apace. The average rate of growth between 2003 and 2010 was nine per cent. We are helping to sustain this growth by launching the Business Innovation Challenge Fund, which encourages entrepreneurism. And we have helped some 800,000 Afghans – many of them women – to start a business with small loans. For instance, a project offering training in business skills is already helping many women sell clothes and embroidery to bazaars. For all its imperfections, Afghanistan has come a long way. Today, it is no longer a haven for global terror. Its economy is growing. It has a Parliament, provincial and district governors and the basic building blocks of what could be a successful democracy. Afghanistan still has many challenges ahead. There are real security issues and a lack of government capacity. But 10 years ago, Afghanistan was in the grip of a regime that banned young girls from schools, hanged people in football stadiums for minor misdemeanours, and banished radios and any form of entertainment – all the while incubating the terrorists which struck on 9/11. We have a vital national security interest in preventing Afghanistan from once again becoming a safe haven for international terrorism. British forces will no longer be in a combat role or in significant numbers in Afghanistan by the end of 2014, but the UK’s long-term commitment to Afghanistan, as set out in the Enduring Strategic Partnership Document signed on 28 January 12, will last well beyond 2014. We have demonstrated our long term commitment to Afghanistan through our £70m contribution to future of the Afghan National Security Forces and £178m per annum support for Afghanistan’s development.